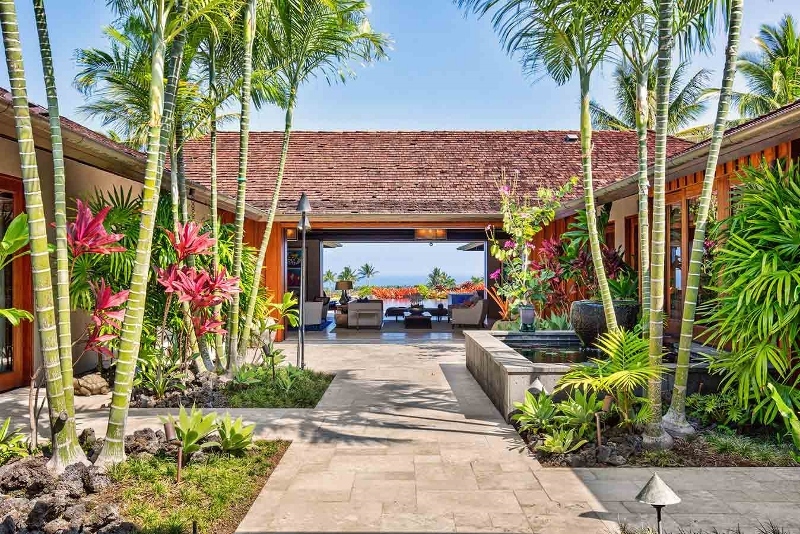 Kahua Luxury Estate – Luxury Vacation Homes, Inc. 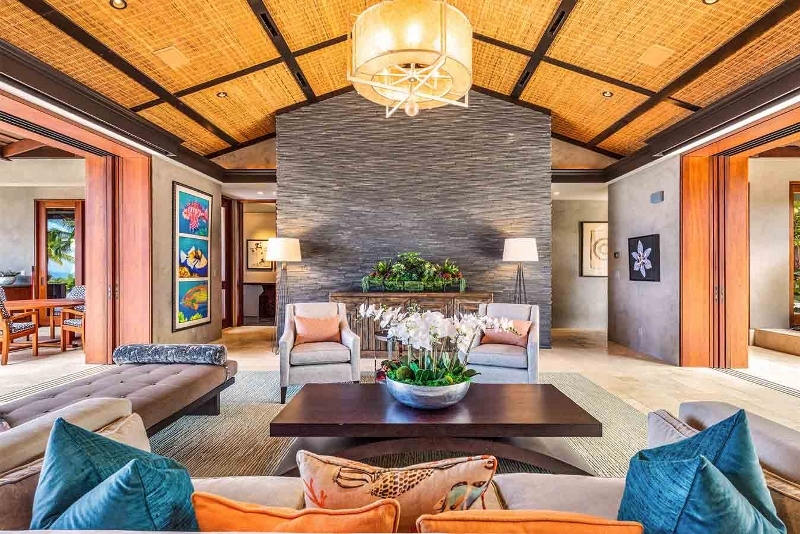 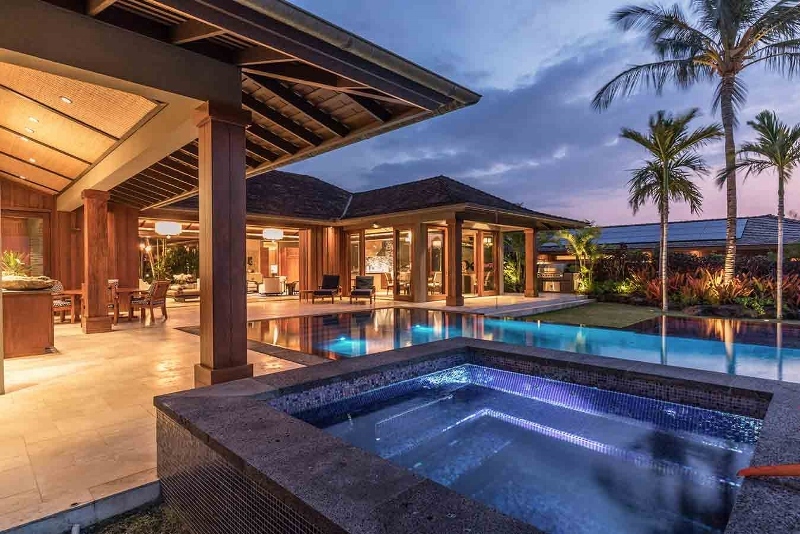 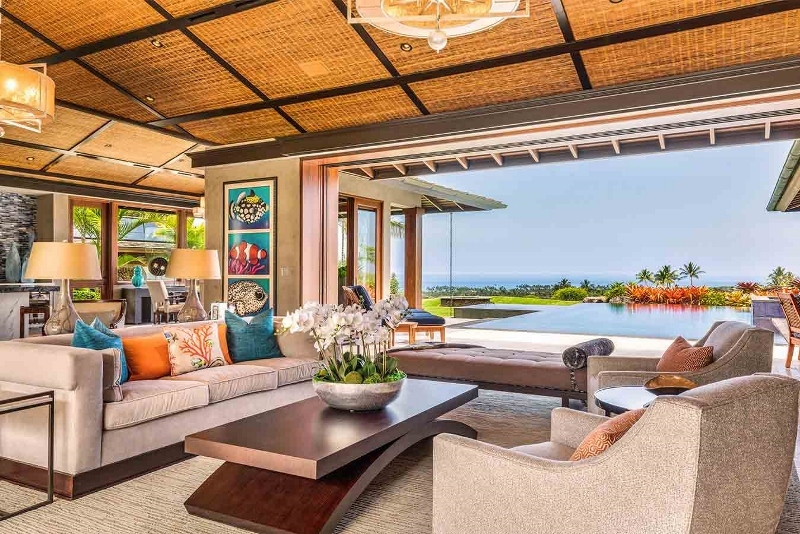 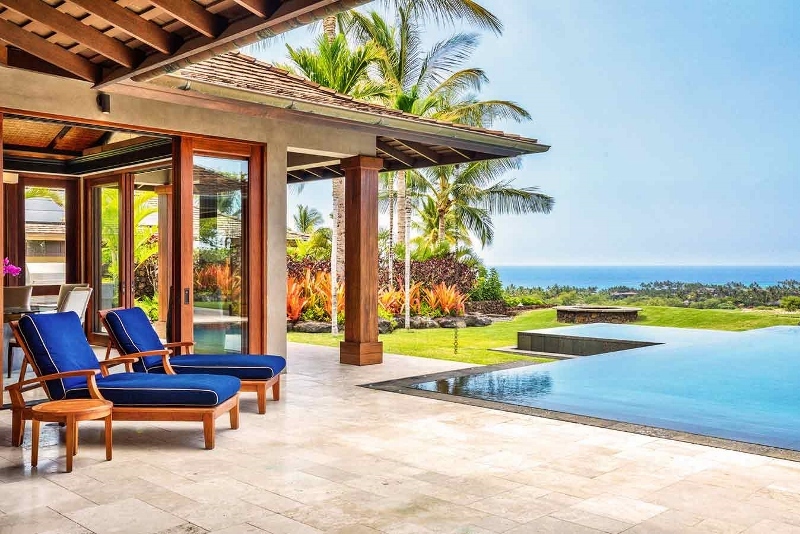 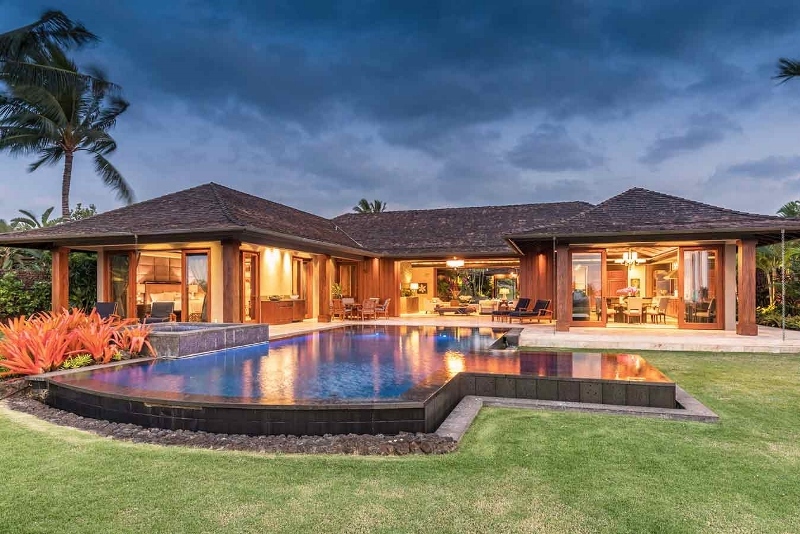 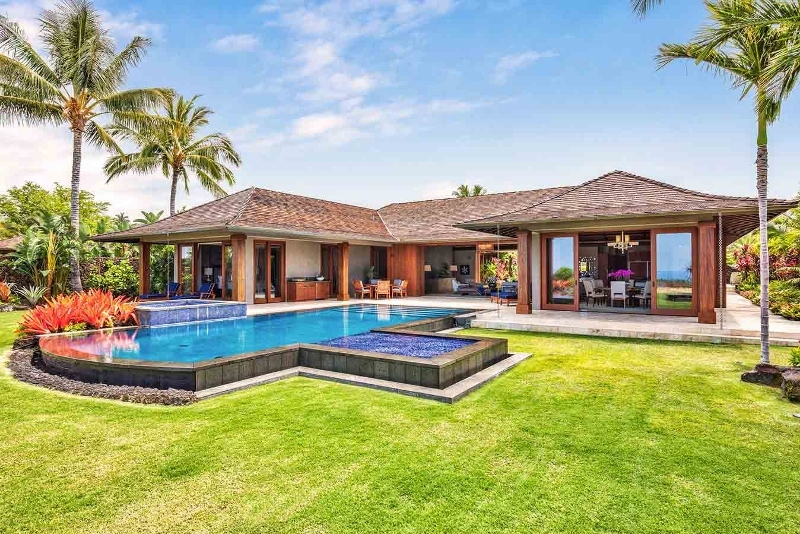 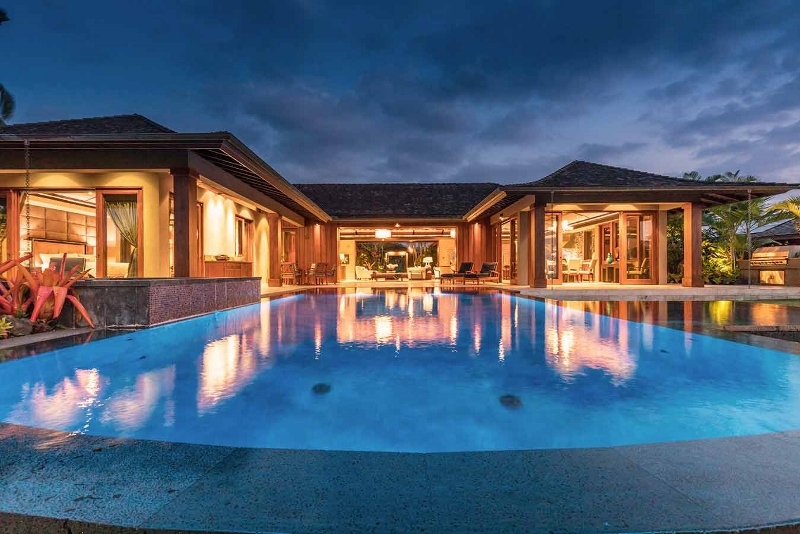 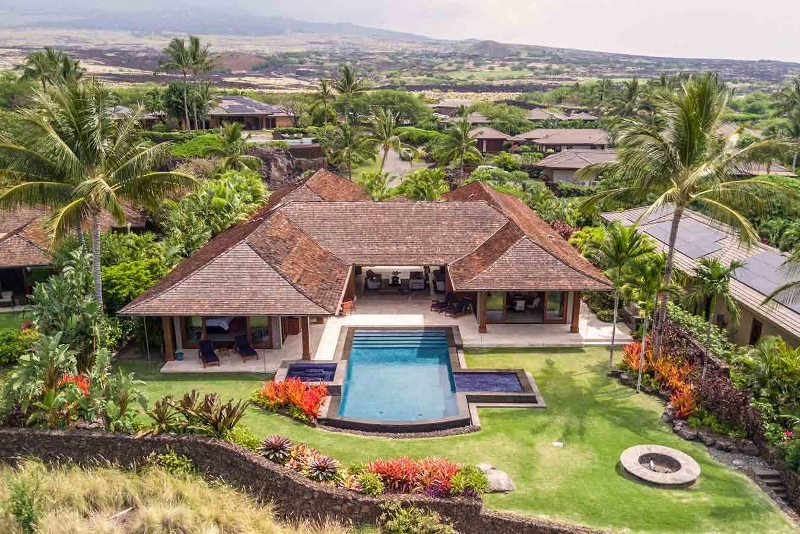 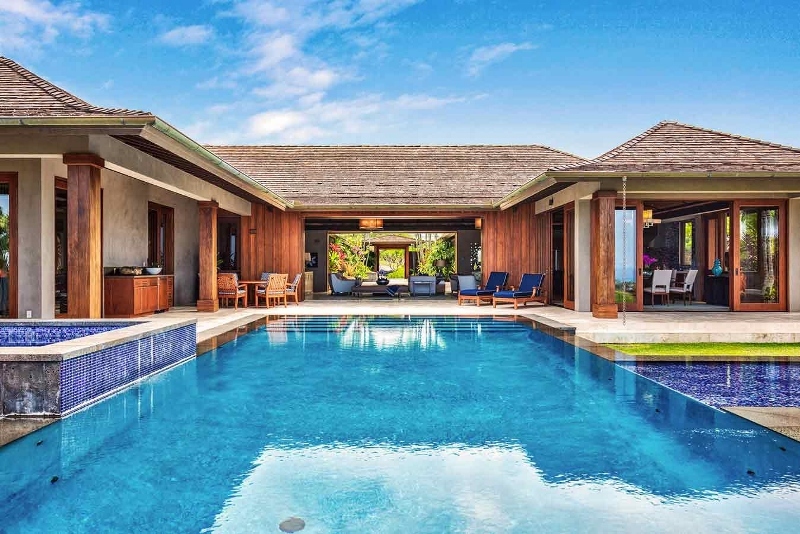 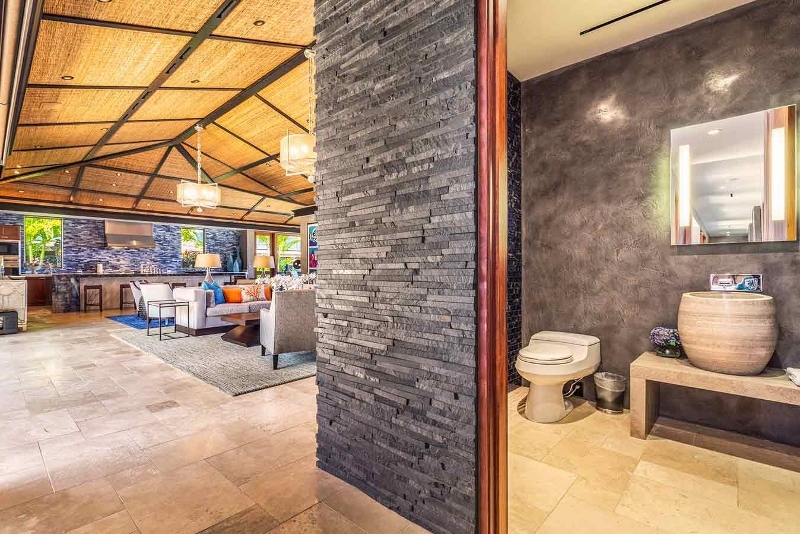 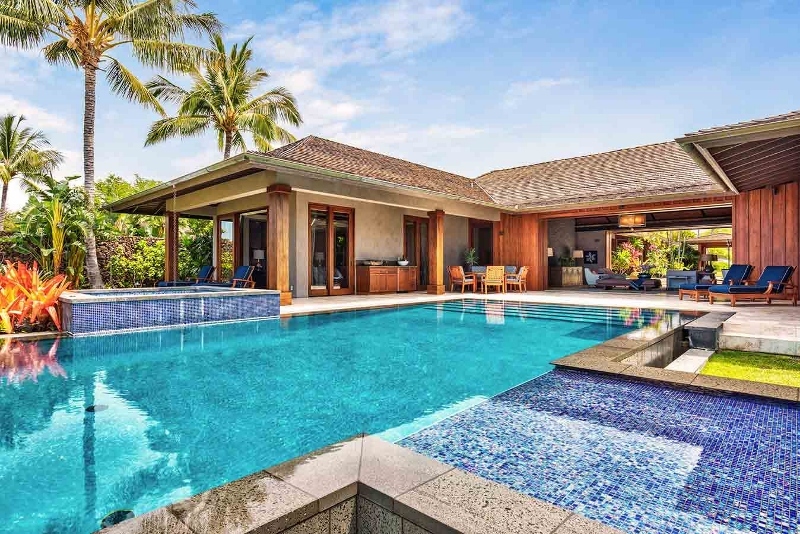 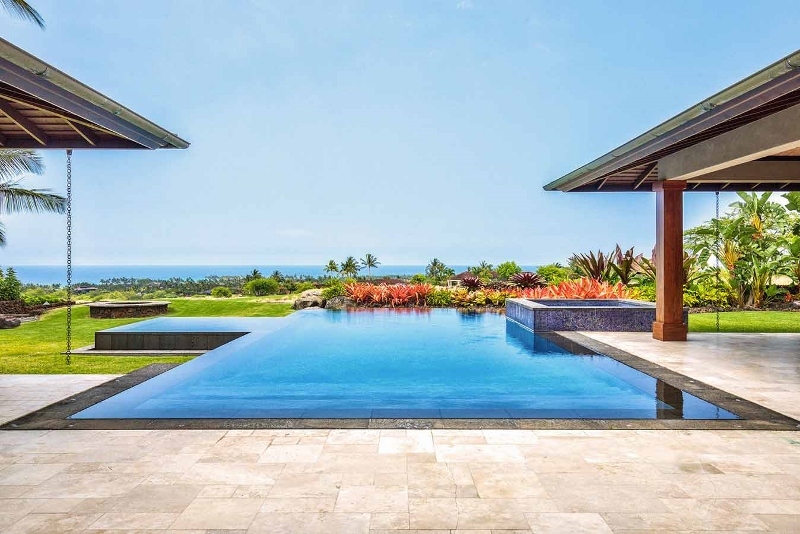 The Kahua Luxury Estate 5 bedroom, 7 bathroom home wasn’t just built on the island—it was created from it. 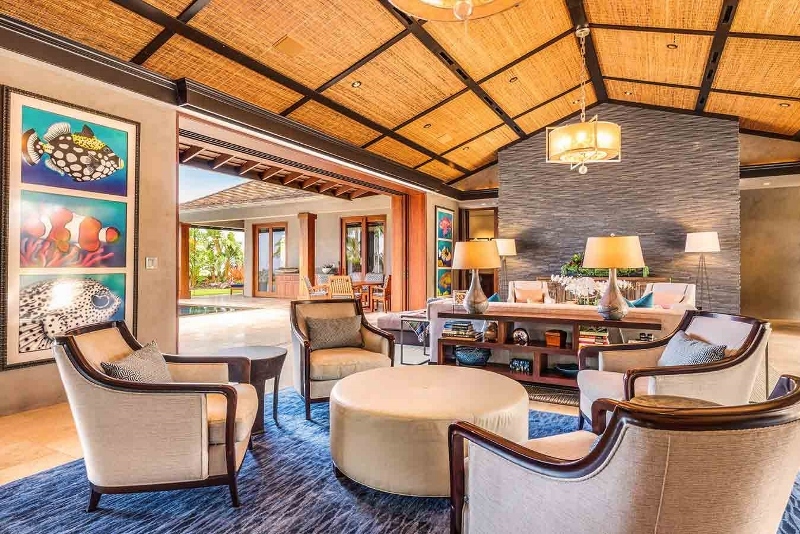 With natural beeswax and island stone clad walls, Hawaiian spirit comes to life. 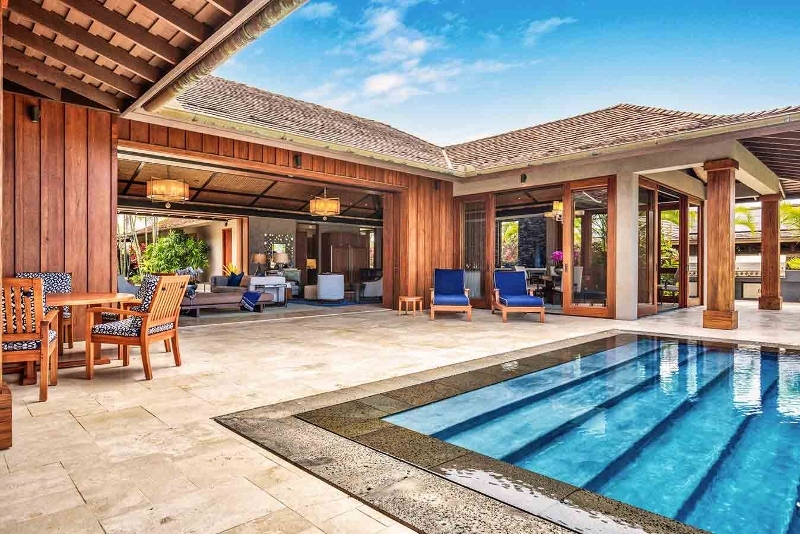 With an infinity pool and hot tub—both just steps from open lounge area seating—and an interior courtyard with koi pond, the line between inside and outdoor living is dreamily blurred. 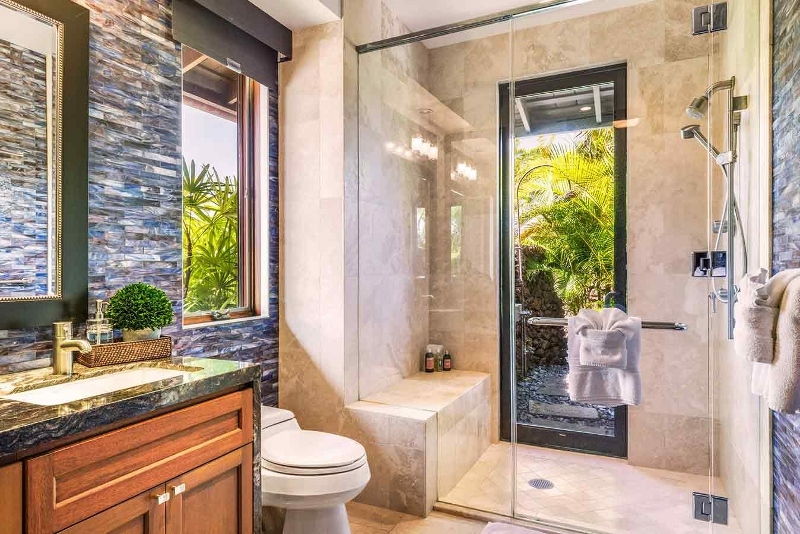 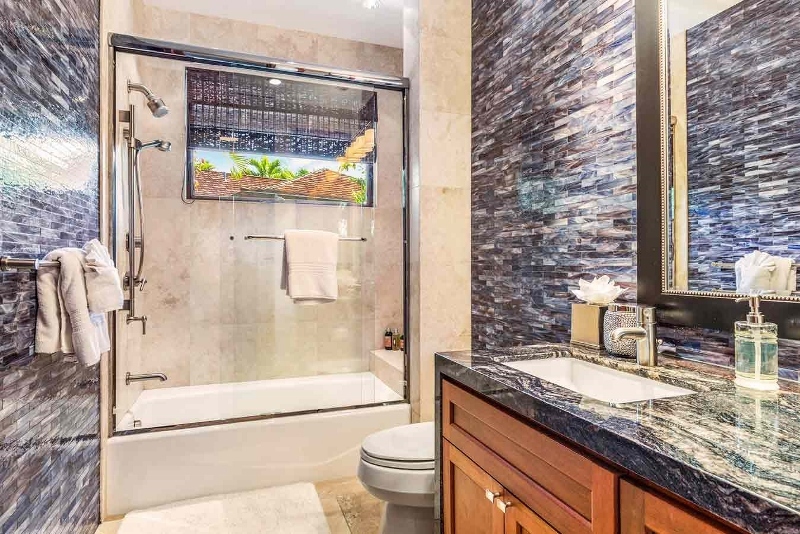 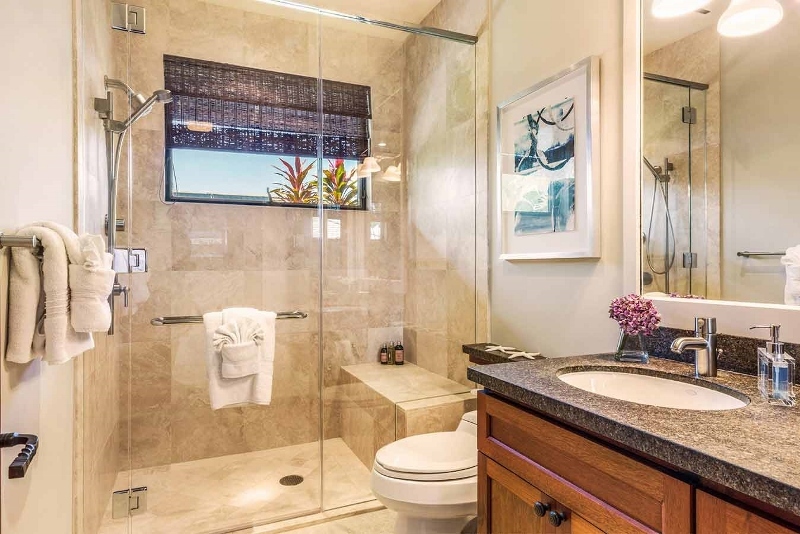 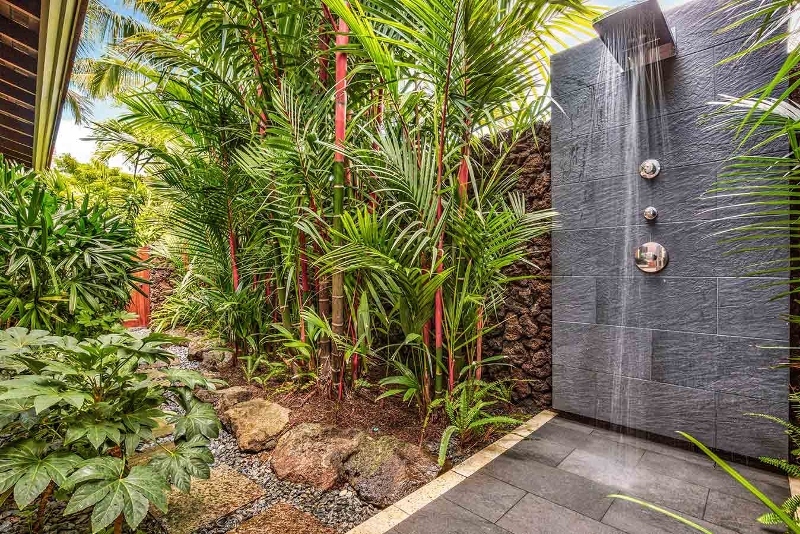 Lush gardens, a covered patio, and the master bathroom’s deep soaking tub complete the paradise. 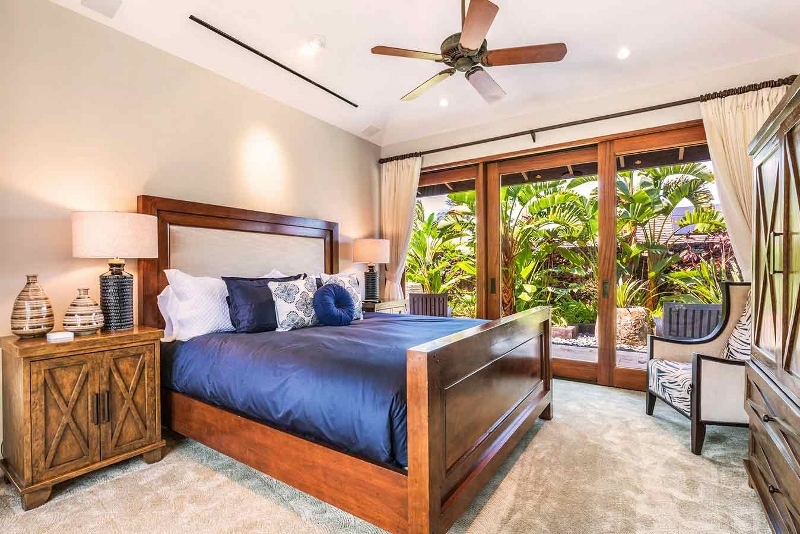 Massive disappearing pocket doors slide open to bring you even closer to the coast’s natural beauty, and to invite its breezes into the living areas. 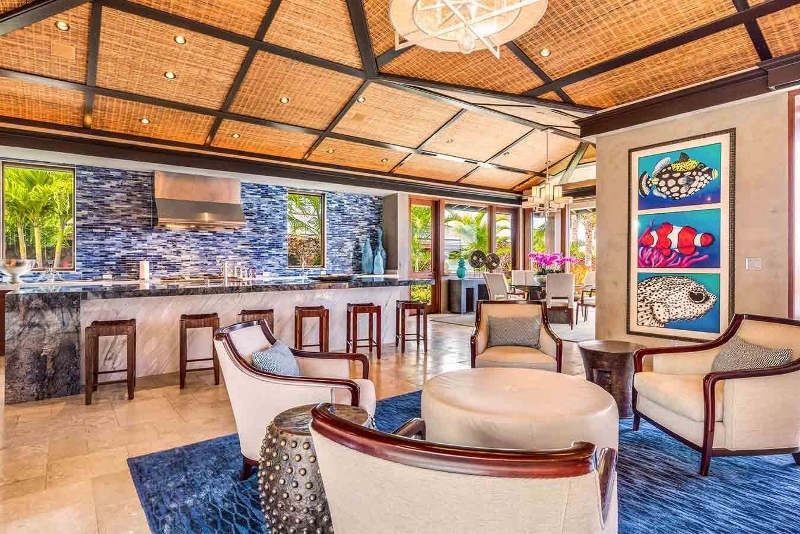 Slide open the pocket doors and get acquainted with paradise in the main living space, featuring chic, coastal appointments and enough seating for the entire group. 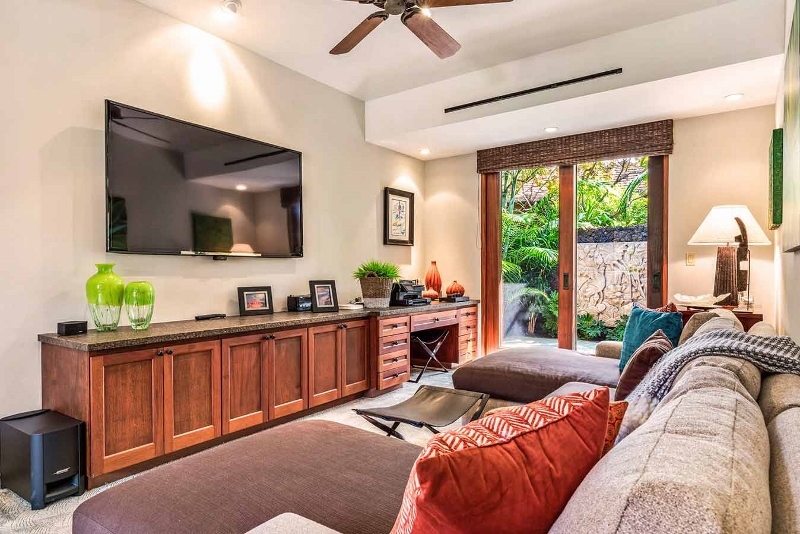 Enjoy your favorite films in the media room, offering a large TV and plush sectional. 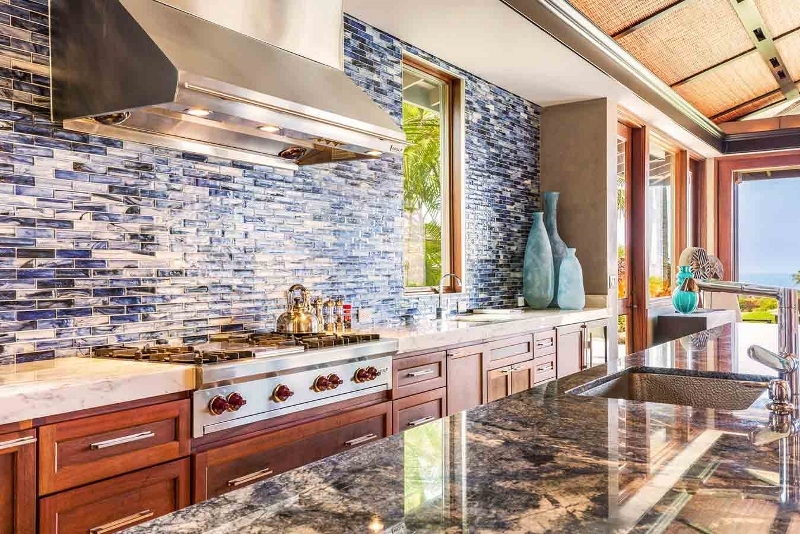 The gourmet kitchen is a delight, outfitted with custom cabinetry and Wolf and Sub Zero appliances including a double oven. 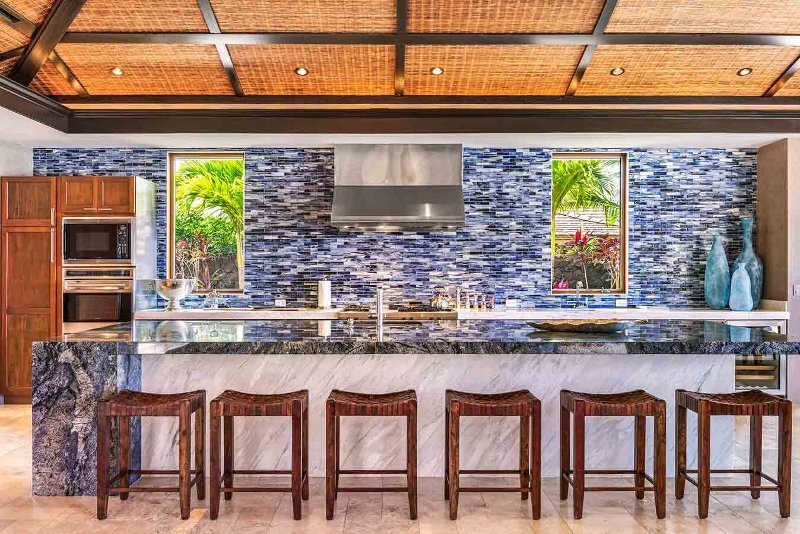 There’s plenty of seating at the bar for those who want to lend a hand or socialize. 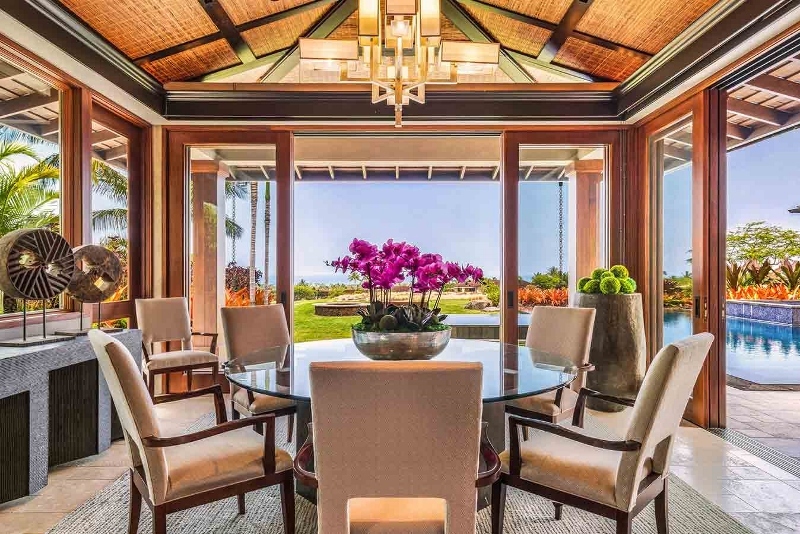 Come together in an open air dining space to enjoy your meals with endless ocean views, or host an outdoor meal in the covered dining area tucked at the edge of the infinity pool. 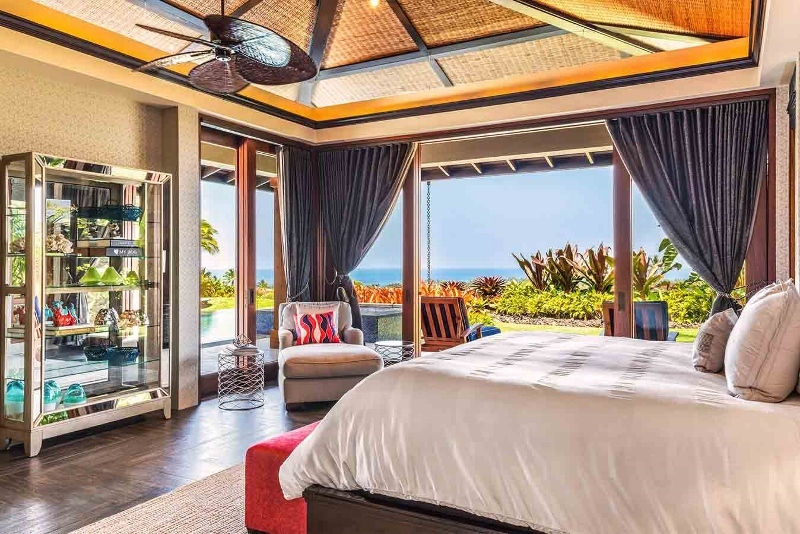 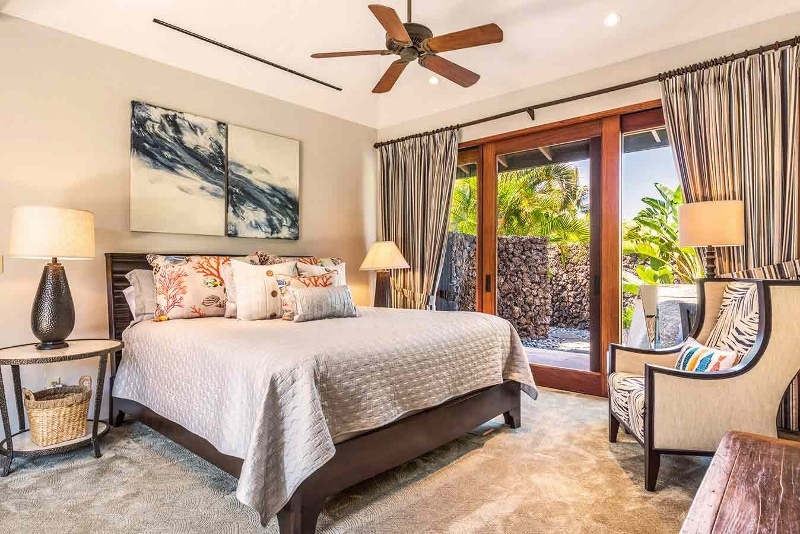 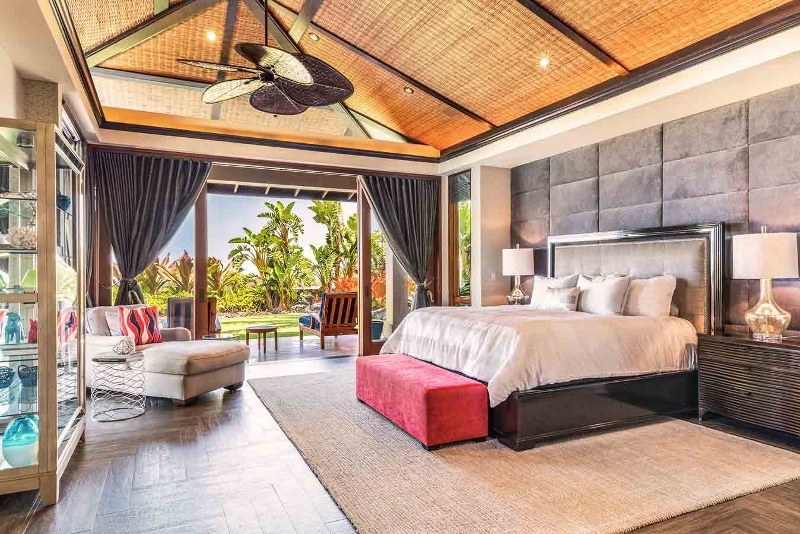 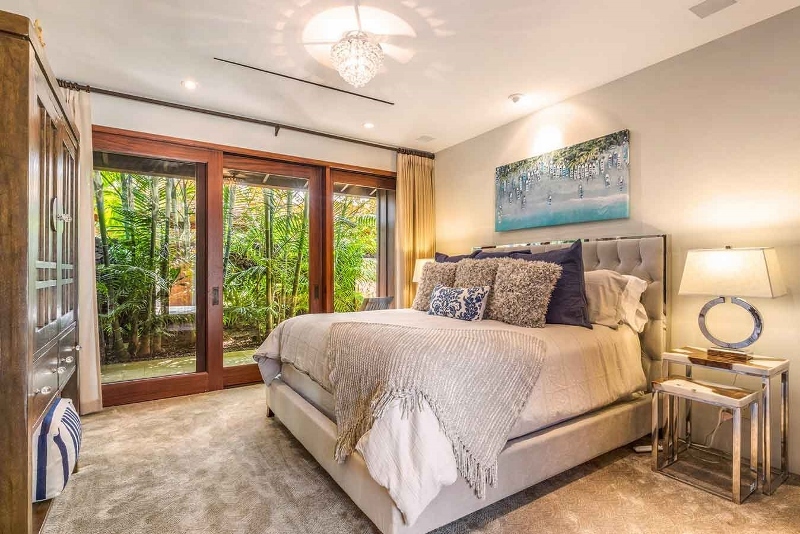 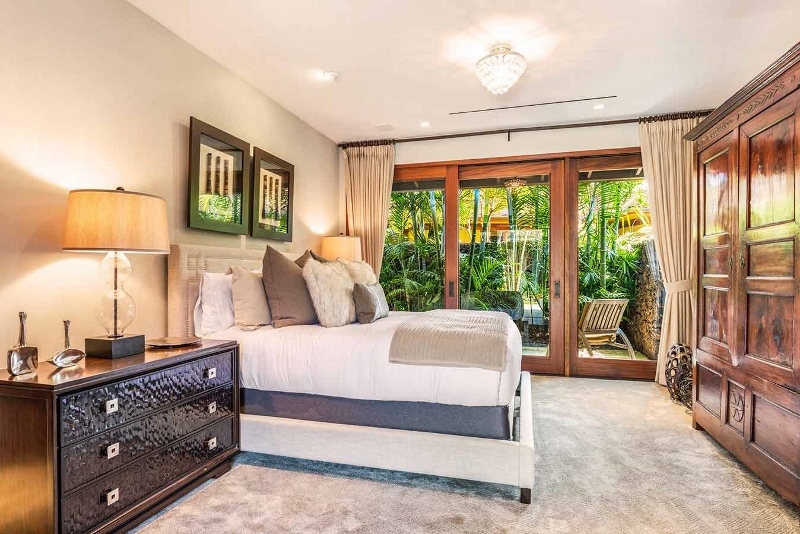 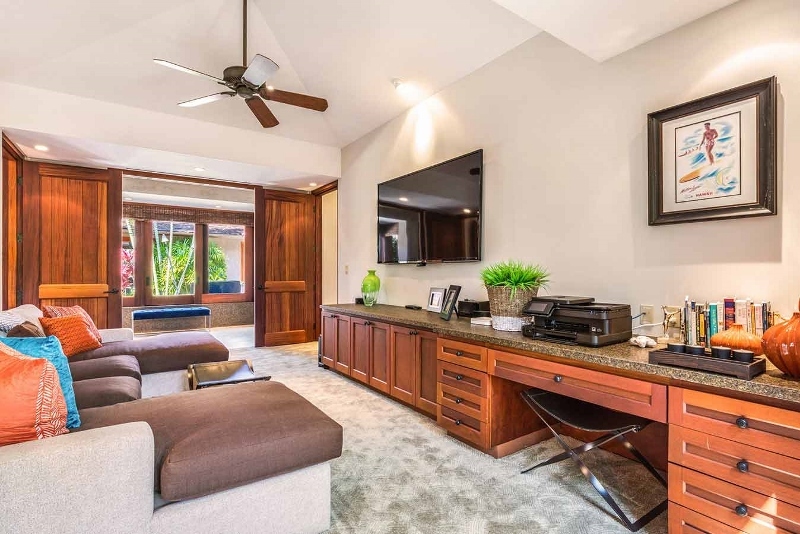 Every bedroom has its own door that opens onto a private pocket of tropical landscape, ranging from open lanais to intimate gardens. 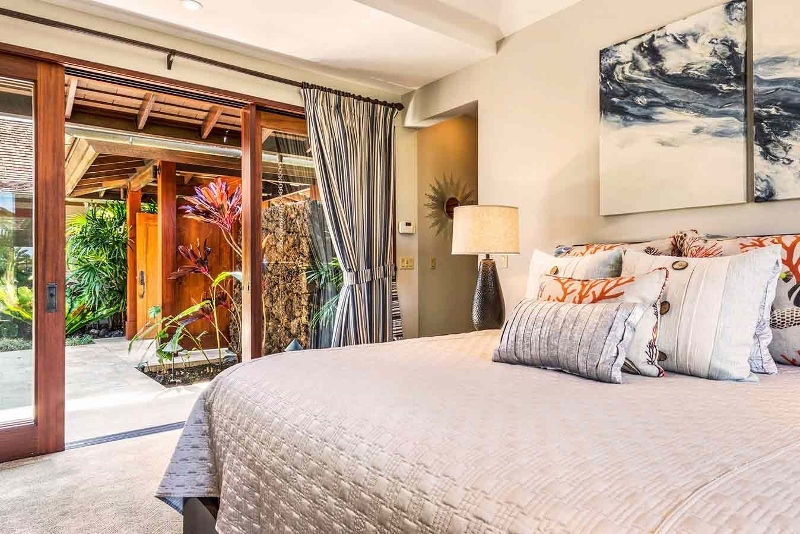 The main house holds three of the bedrooms, while the remaining two are tucked within a totally separate guest house—offering a spot for everyone to find their own hideaway. 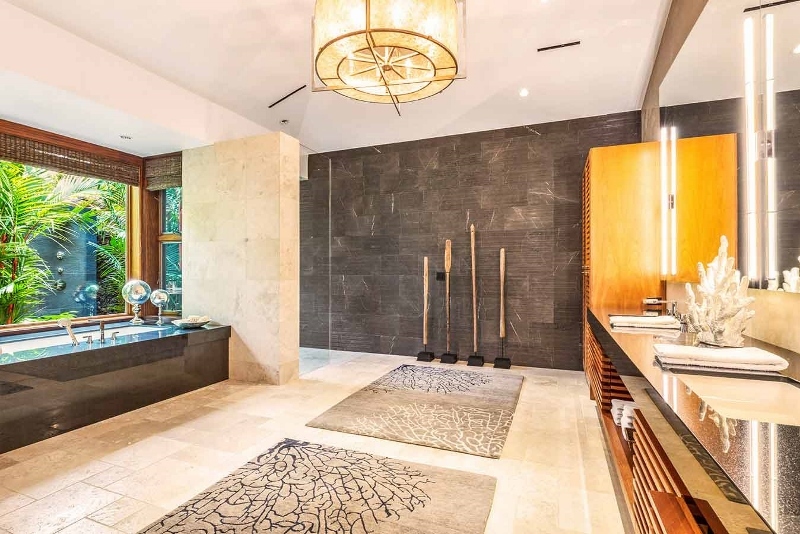 Staff Services: Daily light housekeeping included. 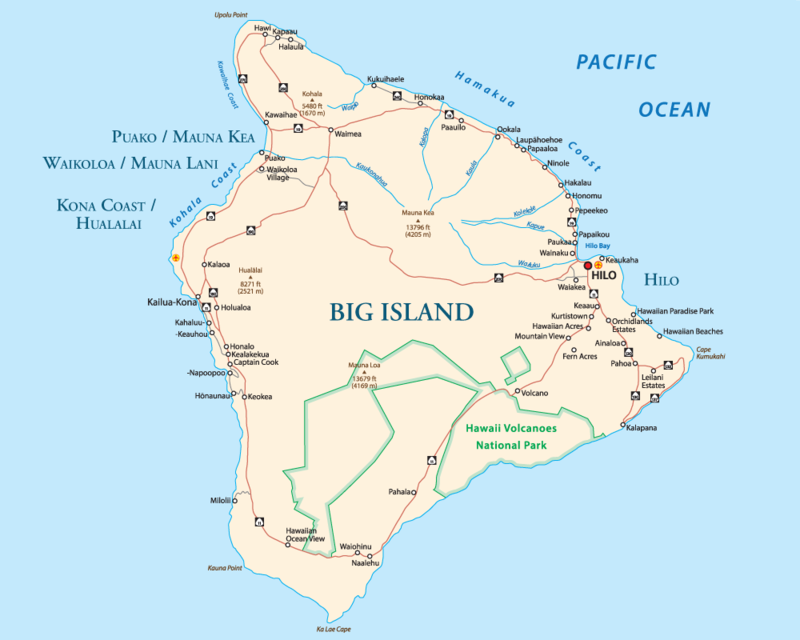 Additional staff services available at additional cost.